when he saw the painting for the first time. He'd been in this store dozens of times but he'd never noticed those pictures before. He wasn't an art critic, but he knew he'd never seen anything like that train picture. and somehow that scene looked more real than life! and the red caboose, so real you could almost step right into it. and cast a long late afternoon shadow. The mountains were a blue haze against the distant horizon. A bell rang. The store was closing. with five dollars that should have gone to overdue bills. He didn't know when he'd be able to manage the eleven-ninety-five balance. He paid for the curtain rods and went home, feeling a little guilty. She stood back and looked critically at the curtains she'd hung. He told her that they made a big difference in the little apartment. She smiled and said that the curtains looked better than the trash cans in the alley. and that she believed in him. He didn't mention the money he'd foolishly spent on a picture of a train. Payday again, and another losing battle with arithmetic. it might raise their spirits. It would interrupt the drabness. He felt sorry for her, being stuck there all day. At least taking the bus to the factory everyday gave him a change of scene. and waited for the large picture to be wrapped. and called her to come in from the kitchenette and take a look at the surprise. until her eyes stopped at the explosion of color. She almost cried! It was like having a window to a valley locked in sunset. They held hands and stared at the painting until dinner almost burned. where they were to spend their final years. but they weren't complaining. They'd been through rough times before. 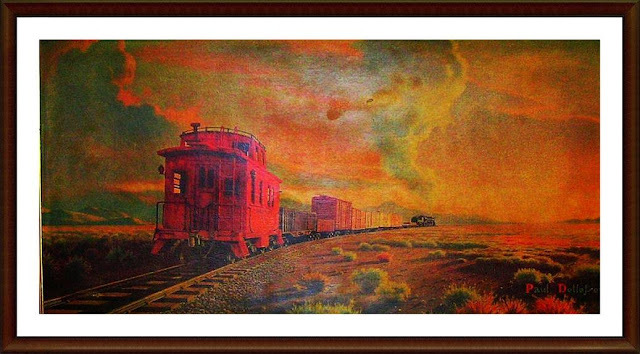 the Sunset Train painting and their love for each other. Maybe they weren't so poor after all. It hit him hard when she passed away. Somehow, he'd always imagined he'd be the first to go. He wasn't prepared for the emptiness. Nobody ever is. He took the habit of talking to her, even though she was gone. He'd stare at the painting and go over old times. but his eyes would wander back to the Sunset Train. He'd imagine that they were together in that valley, or riding on the train. The neighbors often dropped in to check on him. Conversations always gravitated to the painting. Several days passed before they noticed the mail and newspapers outside his door. the neighbors set their shoulders to the door and the old wood gave way. the neighbors notified the police of his disappearance. "Unusual painting in there! Realistic, I mean!" "Yeah," replied the other, "everybody remarks about that train picture." "No," said the policeman, "I'm talkin' about that picture of the valley and the sunset. There's a track runnin' through it, but no train." And he was right. The train was gone. Labels: 2018, December 4, Jack Blanchard's Column, Rondoids, THE SUNSET TRAIN.